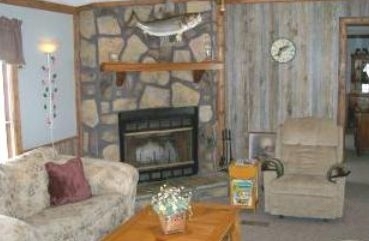 TheCoveVacationLakeHomes.com offers you the best value in a vacation destination. Our 4 bedroom, 2 1/2 bath luxury, lake view rental home is located in a secluded valley overlooking a lovely Norfork Lake cove. A short walk down a gently sloping, grassy lane will take you to the lake for swimming, fishing or exploring. This home is perfect for family reunions, group gatherings, retreats and private getaways. The Meadow Cottage has a gorgeous view of Norfork Lake from the covered, fan lit deck. This home has a fireplace and a Jacuzzi tub making it the perfect setting for our Couples Getaway Special offered in the spring, winter and fall for $99/night plus tax. Our summer guests will enjoy the above ground swimming pool in the fenced backyard with a swing set for the little ones. A campfire ring, large BBQ grill and basketball hoop are located in the front yard. 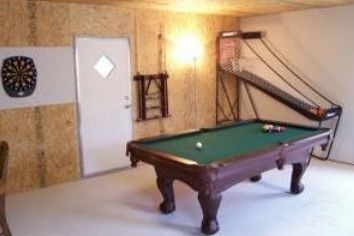 The private game room has a pool table and an indoor basketball shoot game. The Meadow Cottage is completely outfitted with everything you might need for your stay including a dishwasher, washer/dryer, ice maker refrigerator, satellite TV and free WiFi. All towels and linens are provided plus a wide assortment of cookware, bake ware, serving bowls and utensils along with matching Corelle dinnerware. 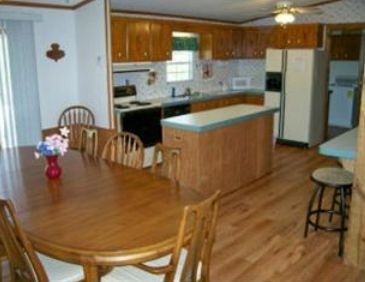 This home accommodates 8 to 14 guests with plenty of seating at the huge dining room table for family meals. Watch the sunrise from your front deck as the deer graze in the meadows below. Bait your hook and head down to the lake as the fish begin to strike the glassy surface of the water. It is so peaceful and relaxing here, you may never want to go home. Just 1 mile down the road there is a public launch ramp and a marina offering stalls, waverunners and boat rentals. Several restaurants are within a 10 minute drive and a 20 minute drive will take you to Mountain Home which offers movie theaters, golf courses, shopping, antiquing, mini golf and multiple dining options. Other day trip activities could include trout fishing on the White or Norfork River, a canoe or river tubing trip, cave exploring at Blanchard Springs, a guided Striper fishing trip, horseback riding or an \'old mill\' sight seeing trip. 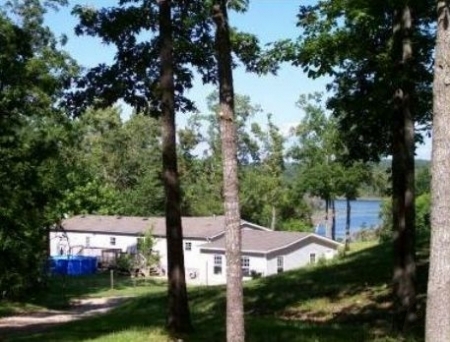 However you choose to spend your time at Norfork Lake, staying at The Cove Vacation Lake Homes will give you the perfect base of operations. Luxury accommodation at an oh-so affordable price. Why stay anywhere else? Visit us at TheCoveVacationLakeHomes.com today. 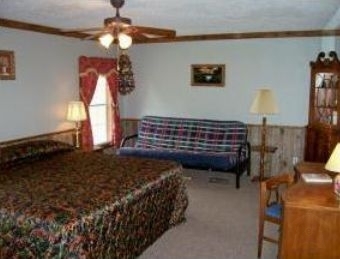 Additional guest $7 per night plus tax. Children 5 and under stay free. Reservations confirmed upon receipt of deposit. Balance due upon arrival. $100 - $300 deposit required depending on length of stay. 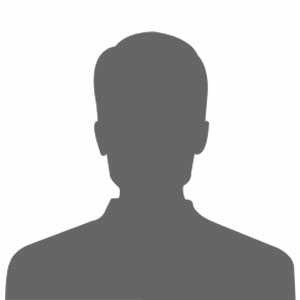 In case of cancellation, deposits will be returned (less 10%) upon re-rental of unit. Saturday to Saturday rentals only from 6/4/11 to 8/13/11. Off-peak season rates are for December, January and February. Sorry, no pets. Smoking is outside only. 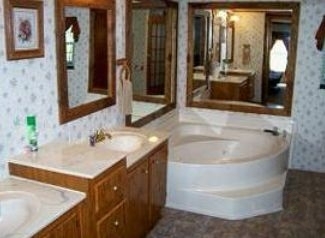 Master bath has shower plus a Jacuzzi tub. Hall bath has a tub/shower. Half bath has sink and toilet. 4th bedroom - 2 sets of bunk beds.